Right now we’re wilting from the heat and humidity of summer, but if you’re a crafter, you’re probably thinking about or have already begun your holiday craft projects, especially those of you who cross stitch or do other needlecrafts because unlike many other crafts, needlework takes time. Even small projects require hours to complete. In my craft room my bookshelves are filled with cross stitch books. My favorites are the ones filled with lots of different projects. 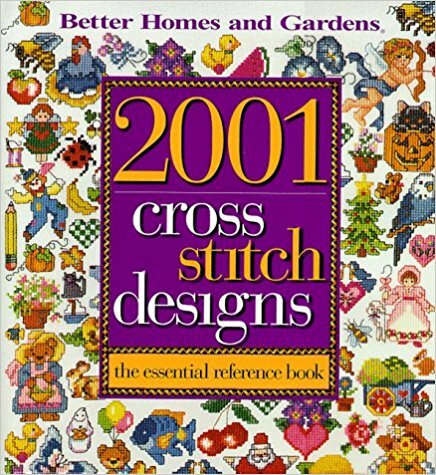 My all-time favorite is 2001 Cross Stitch Designs. I think the title is pretty much self-explanatory as to why it’s my favorite. 2001 different designs in one book? Talk about a bargain! Along with all those cross stitch charts in full color, the book also includes basic cross stitch tips, project patterns and finishing directions, 50 different specialty stitch diagrams, and directions for designing your own cross stitch. Each chapter is filled with anywhere from dozens to hundreds of motifs divided by categories. Chapters include florals, designs for children, country themes, Americana, nature designs, animals, special occasions, sports and hobbies, alphabets, borders, and holidays—including an unbelievable selection of Christmas designs. Within the pages of this book you’ll find a project for every person on your gift-giving list.